The Hospitals of Providence Transmountain Campus selected Specialists On Call, Inc. (“SOC”), the largest provider of telemedicine services and technology to acute care hospitals, as its partner to offer teleNeurology services. The program went live, May 11, 2017 and hopes to enhance the patient experience through quicker access to specialists. The Hospitals of Providence Transmountain Campus is a 106-bed facility serving as a teaching facility for Texas Tech University Health Sciences Center El Paso medical students, residents, nursing students and researchers in northwest El Paso, Texas. The Hospitals of Providence Transmountain Campus selected Specialists On Call, Inc. (“SOC”), the largest provider of telemedicine services and technology to acute care hospitals, as its partner to offer teleNeurology services. The program went live, May 11, 2017 and hopes to enhance the patient experience through quicker access to specialists. "We are happy to be chosen by The Hospitals of Providence Transmountain Campus to partner on this important initiative for their community and patients,” said Hammad Shah, CEO of SOC. “SOC prioritizes quality care and clinical outcomes above everything else which matches The Hospitals of Providence Transmountain Campus goals. We look forward to being a supportive partner to them going forward." 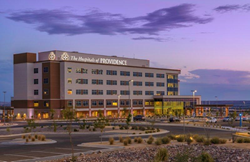 The Hospitals of Providence Transmountain Campus opened in January 2017 on El Paso’s far west side, creating the newest full-service hospital in the Hospitals of Providence network. Transmountain Campus serves as a teaching facility for Texas Tech University Health Sciences Center El Paso and will train up to 100 medical students, residents, nursing students and researchers across a multi-year program. About Specialists On Call, Inc. Specialists On Call, Inc. (SOC) is the largest provider of acute care telemedicine services and technology to US hospitals and partners with approximately 400 hospitals and systems across 36 states. Through its Neurology, Psychiatry, and Critical Care solutions, SOC virtually delivers physicians directly to the patient’s bedside. The company's Consult Coordination Center (CCC) is the hub of its clinical and operational support teams, and dedicated to accelerating patient care through a fully redundant and state-of-the-art platform. SOC provides industry leading reporting and analytics and lean six sigma support to optimize workflows towards achieving high clinical outcomes. SOC’s flexible, enterprise Managed Services offering enables hospitals to rapidly deploy and seamlessly optimize or expand a telemedicine program by leveraging its proven and scalable infrastructure. The organization was the first private provider of acute clinical telemedicine services to earn The Joint Commission’s Gold Seal of Approval and has maintained that accreditation every year since inception. For more information, visit http://www.specialistsoncall.com.